The Imperial Order of the Iron Crown - HRE (Italian: Ordine imperiale della Corona ferrea; German: Kaiserlicher Orden der Eisernen Krone) was re-established in 1815 by Emperor Franz I of Austria. 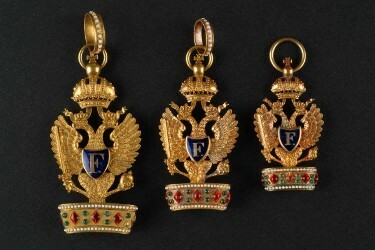 The original Order of the Iron Crown had previously been an order of the Napoleonic Kingdom of Italy. The Order of the Iron Crown (Italian: Ordine della Corona Ferrea) was an order of merit that was established on June 5, 1805, by Napoleon Bonaparte, under his title of King Napoleon I of Italy. The order took its name from the ancient Iron Crown of Lombardy, a medieval jewel with an iron ring, forged from what was supposed to be a nail from the True Cross as a band on the inside. 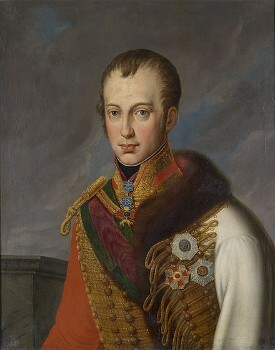 After the fall of the Napoleonic Kingdom of Italy, the order was re-established in 1815 by the Emperor of Austria, Francis I, as the Austrian Imperial Order of the Iron Crown. The Holy Roman Empire, ruled by the Habsburg dynasty, gave way to the Empire of Austria between 1804 and 1806. The last Holy Roman Emperor, Franz II, was proclaimed Emperor Franz I of Austria. His daughter, the Archduchess Maria Louise, was Napoleon’s second wife and Empress Consort, and the mother of Napoleon’s only legitimate son and heir, Napoleon, Duke of Reichstadt. With the collapse of Napoleon’s empire, Imperial Austria regained its traditional control of Lombardy as the Kingdom of Lombardy–Venetia. The Austrian order was also divided into three distinct classes of knighthood, recognized as the First, Second, and Third Classes. Investment of this order carried an Imperial patent of nobility. With the collapse of the Austro-Hungarian Empire, in 1918, all but one (the Order of the Golden Fleece) of the chivalric orders of its monarchy were formally abolished. 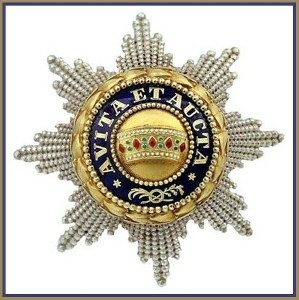 The Second Re-establishment of the Imperial Order of the Iron Crown, being Claimed and Re-established by the Holy Roman Empire Association - Associazioni dei Nobili del Sacro Romano Impero on the 25th day of December 2015, on the 200th anniversary of its first re-establishment and with the Significance of the Orders connection to the Iron Crown of Lombardy, made for Theodelinda, Queen of the Lombards, was alleged to be crafted from one of the original nails in the True Cross used in the Crucifixion of Jesus. Regardless of origin, her crown was crafted of six hinged plates of gold, set with precious gems, and held together with an iron circlet structure underneath. Thus came the term of “Iron Crown”. 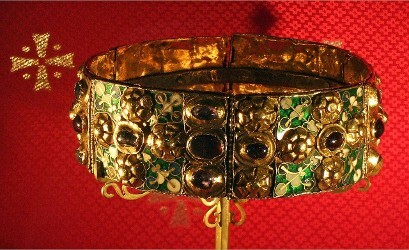 Upon Theolinda’s death in 628, her crown was donated to the Church at Monza, where it still remains. It was used during the coronation of Holy Roman Emperor Charlemagne, as he took the throne of Lombardy in 774. Later Holy Roman Emperors followed suit in this tradition. 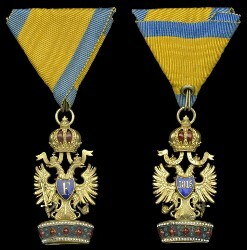 While the ribbon colors changed from the Imperial French gold and green to the Imperial Austrian gold and royal blue, the general look of the medal remained largely the same – an imperial eagle set within a representation of the Iron Crown of Lombardy. 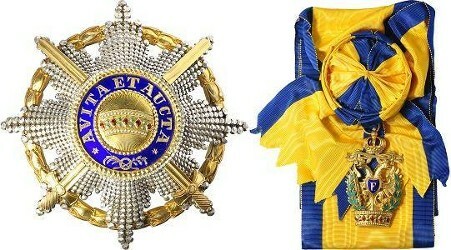 Grand Cross (French) and First Class (Austrian) knights wore a sash and badge over the right shoulder, with an eight-pointed star (that featured the Iron Crown at its center) on the left breast. Imperial French knight commanders wore a traditional military style medal on the left chest, with the addition of a bow in the center of the ribbon to delineate them from ordinary knights. 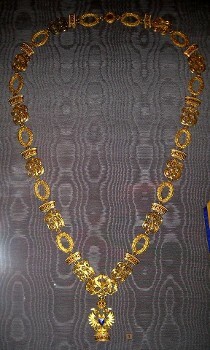 Imperial Austrian Second Class knights wore the medal suspended from a ribbon about the neck. French ordinary knights and Austrian Third Class knights wore a traditional military medal on the left chest. 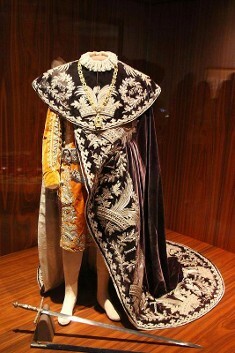 From 1908 for First Class knights, and from 1917 for Second Class knights, the Imperial Austrian order allowed for an undress version to be worn with service dress. First Class knights were authorized to wear a Third Class military medal on the left breast, with an addition of a device known as a "Kleine Dekoration". 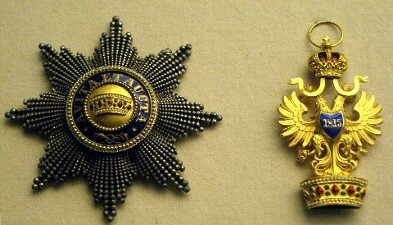 The pin device was a miniature version of the First Class breast star, and was worn on the center of the ribbon to delineate the wearer as a knight of the First Class. Variations in the star matched the details of the knight's specific award: including the war decoration wreath and the crossed swords. The Second Class Kleine Dekoration was a miniature depiction of the Iron Crown of Lombardy (copied from the lower part of the actual medal). As with the First Class knights, the Kleine Dekoration for the Second Class knights matched the award to the knights: crown only for peacetime award, crown encircled by a wreath for the war decoration, and topped with swords for those awards "with swords", and was worn in the same fashion as that of the First Class knights. During the Great War, awards "with swords" were given to symbolize personal valour of the knight that led to his award. Hence, ordinary knights medals were also frequently adorned with crossed swords, pinned to the tri-fold ribbon. 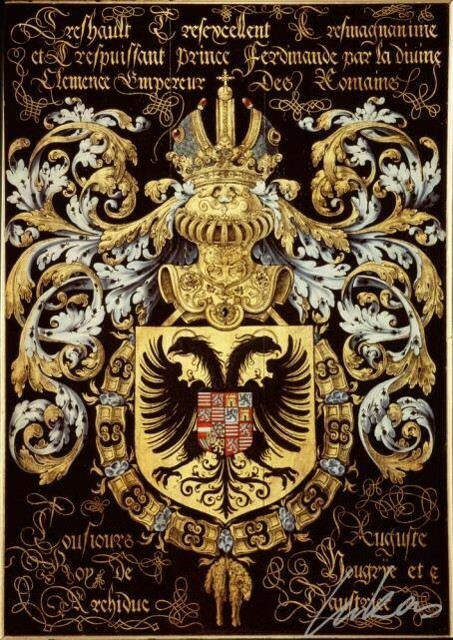 The present status of the Imperial Order of the Iron Crown, is that of a Chivalric Order of the Holy Roman Empire, as such all Rights, Patrimony and Property (including the usage of all Armorial Bearings, Signs and Symbols), of the Imperial Order of the Iron Crown come under the exclusive ownership and protection of the Holy Roman Empire Association - ASSOCIAZIONI dei NOBILI del SACRO ROMANO IMPERO. The Present Nominal Grand Master of the Imperial Order of the Iron Crown is the Chancellor of the Holy Roman Empire Association - Associazioni dei Nobili del Sacro Romano Impero. Copyright (C) The Holy Roman Empire Association, hold full International Copyright to the Imperial Order of the Iron Crown. Copyright Held 2016 - All Rights Reserved Protected by European, U.S. and International Copyright Laws.